Everything Rachael Ray: Want Some EVOO? Thanks to Elise of Simply Recipes, Alejandro Levins of Alejandro & Martin Olive Oil recently contacted me with a great deal for Everything Rachael Ray readers. The company has decided to give away 800 cases of olive oil to select customers and you are one of them! The company is so confident in their product that they believe you will come back after trying their olive oil. If you are already sold, go here (a special page for ERR readers) and get yourself some free olive oil while supplies last. You still have to pay for shipping and handling. It's kinda weird because you put in your credit card information and then you find out the shipping amount, then you have the chance to confirm before you are charged. For shipping from Massachusetts to Northern California, I paid $8.63, so it's reasonable. I got mine to commemorate the addition of "EVOO" to the dictionary. We are motivated by a love for great food and great olive oil. (See About Us for more about us.) Our business is small, but growing through word of mouth and some PR. Instead of putting all our marketing dollars into advertising, we have invested it into product, instead. 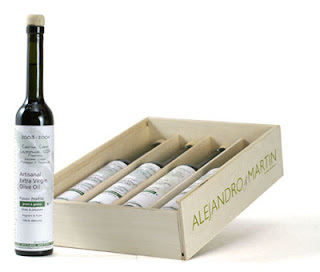 Now, giving away 800 boxes of olive oil may sound like a dumb idea--and it may be one! But, our experience has been that when food lovers try our product, they come back for more and recommend us to others. Our challenge has not been satisfying our customers, but has been finding them! I will let you know how I like mine once I get it in the mail! Go get some for yourself while supplies last by going here. Awesome! I just ordered one too. It came to $6.21 (I'm in Massachusetts). Thank you for sharing! PS: It's actually quite a small amount though. 4 - 3.3 Oz bottles -- but still a great deal on quality oil. Erin - yeah, it's not a whole bunch, but for the quality, it's still a good deal. And look how cute the bottle are! Patti - you are welcome. I will convey your thanks to Alejandro. What a deal! My shipping to Minnesota was only $7.78. Thanks for the great find. Yeah, Uncle Stephen! I am glad you got some. They extended the deal yesterday to give 200 more cases away, so you had good timing. Thanks for the notice of this awesome deal! I just got mine this morning and it's a great little package. I think I am the only one left who hasn't gotten it yet! My friend Kate got hers, your got yours. Sigh. It better come on Monday!